Crisis is not an attractive word. The word often suggests that we are facing a catastrophic disaster; if it didn’t feel this way, we wouldn’t call it a crisis. Imagine the feeling – it feels as if segments of the sky are falling on our heads, we have vivid visions of the earth rending asunder beneath our feet and tsunamis approaching just over the horizon. But yet again, a crisis is not quite a disaster, not yet. During lucid moments and on hindsight, we come to recognise that though there was a sliver of threat of an impending disaster, the crisis was more accurately a call by our whole psycho-somatic system for immediate and drastic action. In fact great good can come out of a critical situation if such action is taken; or if unaddressed, then it could turn out to be the disaster foretold. A crisis of faith, like any other crises, follows the same pattern. A crisis of faith takes place when you reach a dead end, then realise you simply have no faith in your faith. Our inability to find a way out of our problems makes us feel abandoned and betrayed by the Lord. The two disciples on the road to Emmaus would have certainly experienced this. The shocking demise of their Master had left them questioning their faith; they have become uncertain about their prior convictions and beliefs, which had appeared so certain when the Lord was alive. And as a result of this crisis, this seeming catastrophe, they are now rendered emotionally insecure, bewildered and, wandering as sheep without a shepherd. Wherein precisely lies the crisis in modern times? Of course, there are the age old catalysts– unanswered prayer, the darkness and silence of God in the midst of personal crisis, laxity in prayer life and the inability of immature faith to deal with hard questions of life. The surface causes for such a crisis are as varied as individual experience. But today, the causes and occasions for giving rise to faith crises have evolved and multiplied. In fact, as Pope Benedict XVI himself had observed and proposed in his Motu Poprio, Porta Fidei (PF), that there is a serious crisis of faith and this is the reason: faith is no longer a self-evident presupposition in life (PF 2) In other words, our society and culture have become unfamiliar with the vocabulary of faith. More often than not, our children and we are beset by a variety of forces that are totally secular and even sometimes anti-religious and anti-God. A faith crisis arises not because faith contradicts or excludes reason. On the contrary, it is the failure to exercise the full capacity of our reason in service of faith that occasions such a crisis. The age old adage attributed to St Anselm reminds us that “faith seeks understanding”; it does not, however, suspends or abdicates reason. Pope Emeritus Benedict XVI, from the beginning of his pontificate, has called our attention to the problem of a self-imposed limit on the use of reason. One result of this narrowing of reason is making religious and moral questions part of the subjective realm; in other words, a matter of personal preference. In this way, faith has become a matter of sentimentality. Faith no longer has anything to do with knowledge. In other words, I believe because I “feel” that it is true and not because it’s reasonable to do so based on objective knowledge. In a society that thrives off the ‘feel-good’ philosophy, the prevalence of faith crises is understandable especially when faith is associated with the absence of discomfort, pain, suffering, tragedy, or in short, the cross. Thus, today we are witnessing a crisis that affects not just on a small isolated level of individuals grappling with issues of faith. We are witnessing as never before a crisis at a scale that affects thousands and millions within the Church itself. Some are in open rebellion against the faith of their fathers. Other people are not yet ready to discard the faith they may still cherish for purely sentimental or cultural reasons. But they have serious doubts about so much of Catholic teaching. Some articles of faith they are willing to admit, but others they have strong reservations about, e.g. contraceptives, abortion, gay marriages, or anything that does not square with their modern sensibilities. Some have their faith shaken by the scandalous behaviour of clerics in the Church; these former heroes and giants of faith now stand with their feet of clay exposed. Today, there is a whole new vocabulary of relevance, subjective meaning, and dissent that it is no wonder so many have serious doubts not only about this or that feature of Catholic life, but even about its value at all. With the compartmentalisation of faith and its restriction to the private and subjective sphere, it becomes more and more difficult to hold a conversation or dialogue concerning ultimate questions. Yet, this separation of faith and life does not correspond to our nature, it does not match the deep desires of our heart. Our desire is to find meaning in our life, to see the link between the fleeting moment of our circumstance and the big picture. Our desire is for truth, beauty and goodness, and we want this in an objectively real way and not merely for a subjective and sentimental cheap substitute. These aspirations of the heart are what make us human – in fact, our thirst for God is what characterises us as human. In a modern world with few moral champions, Blessed Mother Teresa of Calcutta stands as one of the most well regarded religious leader in recent history. Her work among the poorest of the poor is legendary and her faith, an inspiration to millions. Yet, as it turns out, the missionary who brought light to those in deepest darkness was herself in darkness. After her death, some personal letters were made public in a book. In one of her letters, she wrote an undated address to Jesus, "Where is my Faith - even deep down right in there is nothing, but emptiness & darkness - My God - how painful is this unknown pain - I have no Faith." This must have come as a shock to many, for example, one reporter mockingly quipped that she should be made the patron saint of doubters, but to those who have travelled the necessary road to Emmaus, the story of Mother Teresa is all too familiar. How do we make sense of this? 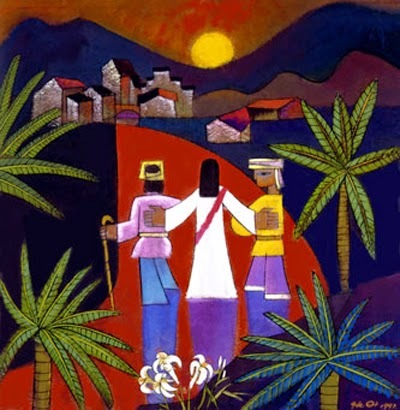 Pope Benedict’s Regina Caeli reflection on the Story of Emmaus provides the answer to this mystery: “This road to Emmaus on which we travel can become a way of purification and maturation of our believing in God.” In other words, a faith crisis is meant to help us grow in faith, not smother the smouldering ashes. It would seem that God’s greatest challenge is to teach us to trust Him, and the only way to trust Him, is to enrol us in the graduate school of hard knocks, wintery darkness, desert dryness, and walk us through the path that passes through Calvary before it reaches the Garden Tomb. It is possible to be not only sustained in this arduous journey but actually to grow into a much deeper and more authentic faith, when we constantly return to the twofold table, once made known the two disciples on the road to Emmaus, and to us at every mass – we are nourished and refreshed as we feed on His Word and His real presence in the Eucharist. It is here that we will discover the object of our deepest longing, it is the Risen Lord, who died for us but has now vanquished our oldest foe, death itself. And it is in this two fold fount of grace, that we will discover that every faith crisis need not end in disaster but in new life!